EnergyBar is a healthy snack with a balance of simple and complex carbohydrate from fruit and grains that taste great. Each bar provides one of your 5-a-day fruit / veg portions. It's moist, easy to chew, does not melt in the heat or become hard in the cold. 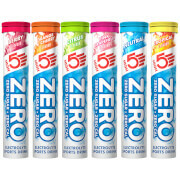 Designed for sports use, EnergyBar has been used for: long distance triathlons, enduro MTB events, hill walking, multi-day endurance racing, Cyclo' Sportives, hill walking, trekking to the poles, cross pacific rowing and swim meets. It's also great as part of a carbo-loading diet. Provides one of your 5-A-Day. 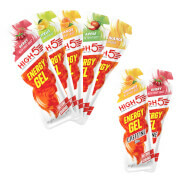 For your next big event or race download the free High5 Advanced Nutrition Guide for your sport/bodyweight/event distance from www.highfive.co.uk. These do their job OK. 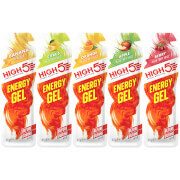 Taste is quite good, they're priced well, easy to carry a couple in jersey pockets, and if you believe they give you an energy boost mid-ride then they give you an energy boost. I'm a repeat buyer. Nice, yummy, energy bar. Coconut was the flavour I have been testing, found this very good! Pretty sweet but I like my sweet flavours! Also has a good bit of moisture in the bar so even when you are a bit dry on a ride it's easy to chew and swallow down. Extremely satisfying product. Full of energy, great taste, easy to chew on the ride. Very good value for money. Would definitely buy another box, and would recommend it too to other riders. I wanted to try this product cause it says it's best seller but honestly it wasn't as I expected tastewise.the price is cheap for the product at pbk but this product wasn't for me.